In Silat ground fighting galls are seen as a fundamental skill that is an essential part of the art. As a result one of the first basic classes in most Pentjak Silat and Kun Tao styles is a combat version of Falls. This is also true in Clear’s Silat (which is a hybrid Kun Tao Silat style). In Silat ground fighting falls you must be able to go the ground and get up both quickly and well while continually defending yourself while moving at fighting speed. As a result there are a few basic drills that are very helpful and essential. One of my favorite Kun Tao Silat ground fighting falls drills is one I learned from Uncle Bill (Willem de Thouars) whereby you drop to the floor as quickly as you can and then without delay you jump from the floor up into the air as high as you can and when you come back down you go all the way to the floor again with your entire body. Once you hit the floor you immediately jump back up into the air. This practice can be done for a few minutes or longer non-stop. It is primarily a monkey drill but most Americans have seen the common house cat move similar to this way at one time or another. 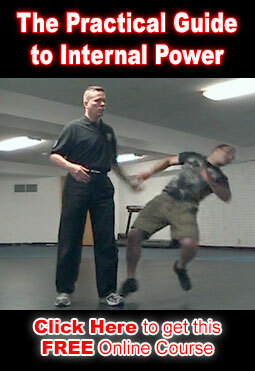 The primary Silat ground fighting Falls recommendation that I make to Clear’s Silat students when rapidly falling to the ground is for them to try to drop legs first and keep their head over their legs and if possible so that they do not fall in such a way that their head hits the floor with added drop due to adding horizontal distance from their starting position. The idea is that if I am 6 feet tall and fall straight down then my head is only traveling 6 feet to the floor and my legs will help slow my descent. If I fall horizontally outward from my original standing position then I am adding to the distance that my head travels and may be accelerating on the way to the floor. If you fall more distance with more acceleration and your head hits the floor then the result would obviously be catastrophic to the average person. In Clear’s Silat ground fighting we also train to instantly counter attack while falling. If the opponent has ahold of our leg we immediately choose to go to the ground rather than let the opponent throw us there. Choosing to go to the ground generally surprises the opponent and (after just a little bit of time spent training it) puts you into an excellent attack position. In Silat ground fighting (and all ground fighting) of course there are times when you will fall to the floor and be unable to keep your legs under you while falling. When that happens whenever it is possible you will want to turn your fall into a roll or partial roll of some kind.